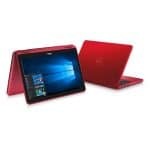 The Dell Inspiron i3179-0000RED is a simply designed laptop meant for everyday duties between home and the office. It has nothing particular that stands out besides its Alpine white colored design, touchscreen capabilities, and convertible nature. I wouldn’t recommend as a gaming laptop as it comes with a simple Core-M processor and no real oomph for gaming (lacks dedicated graphics). Ideally, it is a regular laptop for students who want to make notes, watch movies and save their documents. It’s great as a web browser too and low power consumption (32Whr 2 cell battery) laptop. The Dell Inspiron i3179-0000RED laptop flaunts a decent white sophisticated design. Our reviewed unit was dauntless white in color from the lid to the bezel and keyboard. If you love great design and don’t mind its assertive Alpine white, it’s a great choice for you. Dell also made other colors like the Tango red, Foggy Night Grey, Bali Blue and Tuxedo black among others as an option for those with other sensual preferences. The display is an 11.6 inches wide LED-backlit screen with a 1366 X 768 resolution. This is great for online video and images. It’s no IPS screen and sort of limits the wide viewing angle which is more on the downside. We fell in love with the 360 hinges, you can use the laptop whichever mode is best for you; as a tent for presentation during staff meetings at the office, a tablet when you’re alone and going through photos or just flat while you relax on a Sunday evening. This is a feature we always look forward to in laptops especially when they are touchscreen capable. It measures 7.8 x 11.3 x 0.8 inches and weighs 3.2 pounds, which is rather fair for a laptop in its category. You can carry it around to class, or at home without much struggle. The Asus VivoBook F510UA-AH51 laptop is a similar and better-performing version of the Dell Inspiron that weighs just 3.7 pounds and is slightly larger measuring 14.2 x 9.6 x 0.8 inches. Its predecessor, the Dell Inspiron 11 3000 was, however, a little lighter weighing 2.8 pounds and measuring 0.82 inches thick. A great port selection is a part of what every tech-savvy guy looks for before hitting the add to cart button for a laptop. Dell certainly dropped the ball keeping some legacy components and other outdated ones in this laptop. Well, that might not be a bother for the average laptop user but a big deal and reason to intentionally stay clear for tech-savvy individuals. Of concern here is the lack of USB-C which in the few months since its release has been a trend that Dell should have capitalized on to make sales. Other connectivity options: 802.11bgn 1×1 wireless card Bluetooth 4.0, 2.4 GHz. Just to point out, this is the older version as the current 2017/2016 versions have 802.11ac protocol installed. On the bright side, there is a Micro SD Media card reader for easily transferring files from your camera to your laptop. The trackpad works perfectly well but you can get a regular budget mouse to compliment your work with. The Dell Inspiron i3179-0000RED features a 2.6 GHz Core M 7Y30 processor which in our opinion is very basic. The speeds are fine but the processor is respectable, to say the least. On the upside, Core M processor is terrific on battery life and less heat dissipation. It’s mostly touted around by companies making platforms for the new generation of fanless tablets, phone, and convertibles. Moving on, the processor has a 4M Cache and up to 2.60 GHz Turbo Boost for overclocking. For memory, it has a 4GB DDR3L which is decent for casual users; you won’t be ashamed with that and can occasionally take it for intensive work like photo editing and running scripts. Best of all, it will work impressively thanks to its low power needs. While we’re speaking casual, the Dell Inspiron i3179-0000RED laptop comes with a regular 500GB HDD of 5400RPM rotation speed. It’s nothing fancy or plenty but it does get the job done. You can upgrade the HDD to 1TB when you run out of storage or at least consider SDD along the way. As for graphics, the Dell Inspiron i3179-0000RED isn’t impressive either. I would like to call it out before we go any further; it is not a gaming laptop. Intel HD Graphics 615 is a low-end integrated graphics card which lacks a dedicated memory (or DRAM Cache) so don’t expect much. The way the card is designed is it has to access the main memory to perform which rather strains the processor and as a result gives a lower performance. On Battlefield 1 (2016) it clocked 9.1 fps and Doom 10.1 fps; both results stem from gaming under 1366 x 678 resolution. To understand how the processor and graphics perform in gaming, it helps to check online especially on Youtube. There are numerous examples of both these features running together. Check out LowSpecGamer as he explains gaming experience on an Intel Core -M processor. The Dell Inspiron 11 3000 keyboard provided nothing short of acceptable input options, and the Dell Inspiron i3179-0000RED isn’t any different. We expected some change after the refresh but Dell thought otherwise about taking the opportunity. The keyboard is not stellar and on the 10 online typing test, I managed to hit 73 wpm which isn’t too far from my 78-wpm normal. It’s nothing as clicky as the mechanical keyboard on Eluktronics laptops, but that should work fine for casual computing. The keys have a 1.37 millimeters travel and 54 grams of force to actuate. The keys were great for me for short bursts but not so much for long hours of typing. It has a 3.9 x 2.1-inch touchpad with no click buttons to go with but I’m not complaining. The pad is responsive and allows for two-finger scrolling and also did a great job recognizing three finger Windows navigation gestures. The design is simple and flawless and doesn’t require much power to get by or fans to drain the power either. So we’re looking at a system that emits dissipates less heat and use power considerably well. 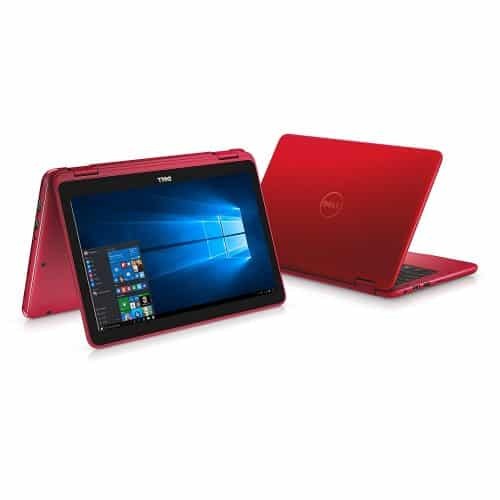 The Dell Inspiron i3179-0000RED has a 2-cell, 32 Whr, integrated battery pack suitable for delivering up to 8 hours of screen life without needing any juice. I’d say that’s enough for a day’s work without carrying your charger along. It carries along through intense day long browsing, editing office documents, sending and receiving emails and other tasks. Dell made sure it has in place a clean installation of Windows 10 and a few other proprietary utilities that could come in handy. There is the Power Assist packages, a system utility that checks the health of your system and has connections to customer support. Lastly, there is the Power Manager Lite that Dell claims offers extended battery life by optimizing your laptop power usage. The Dell Inspiron i3179-0000RED doesn’t bring much to the table in terms of performance and specs as compared to its predecessor. But at its current price point, price it’s pretty budget and great for students and home/office users alike. As far as portability and usability is concerned, the convertible feature is a usable essential that would have come at a price; steeper of course. For now, it’s best suited for traveling enthusiast, college or high school students who need a reliable lightweight laptop for their daily duties. Should you want to opt for a longer battery life and better screen at slightly higher prices, check Microsoft’s far-superior Surface 3 or the Asus Transformer Book Flip TP200SA.